When the fish start biting, you need to be ready to go. Clear Lake in north central Iowa is open to fishing year ’round, and the early bite can be outstanding. 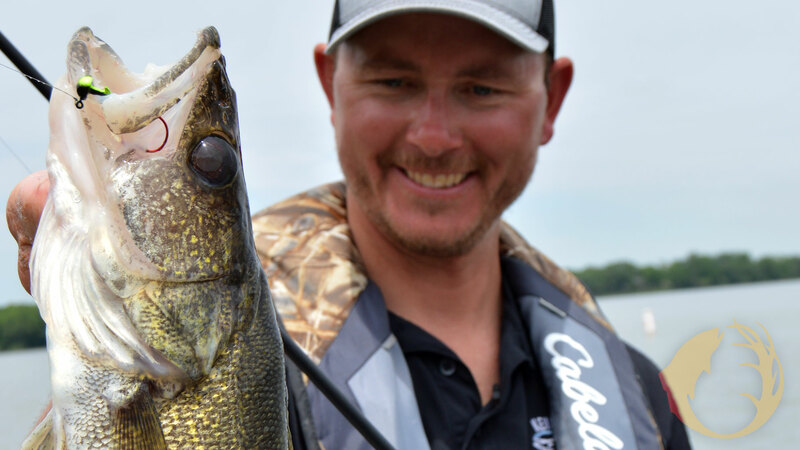 Here’s Clear Lake guide Kevan Paul with an early season walleye. Some Midwest anglers have found open water to fish in, but most of us are still on the ice. For many anglers, that first open water fishing trip is still a few weeks or maybe even a couple of months away. It’s hard to predict ice-out because we never know what Mother Nature is going to do. However, when the opportunity to go fishing gets here, it’s good to be ready. Here are some things you can do now to help get ready for your first open water fishing trip of the year. It’s sportshow season, and sportshows or in-store events like those that Cabela’s frequently offer are great ways to get ready for the next fishing season. You can learn about new products from factory reps, and you can often learn new techniques at fishing seminars. A day or a couple of hours at these events can be very helpful in preparing for the next fishing season. Now let’s get ready to go fishing. It’s important to be prepared, because much of the time, that first day or afternoon on the water is a spur-of-the-minute deal. A friend calls and says the walleyes are biting below the dam on the local river and he’ll pick you up in an hour: You need to be ready! That means you’ve got to have fresh line spooled onto a least a couple of reels. You should start every season with new line. Remember, your line is the only link between you and the fish, and you want that link to be a good one. We have a lot of line choices and it can be confusing which line is best for your needs. For me, monofilament, or something like mono is still a really good choice for a lot of applications. P-Line CX is an outstanding choice, although it’s maybe not a true mono. It’s a copolymer that has a fluorocarbon coating. It’s low-diameter but very strong, abrasion-resistant, pretty much invisible underwater, and casts well. It’s an outstanding product: Spool some up now so you’ll be ready when your buddy calls. Lots of anglers like to fish in waders early in the year. Make sure that if you noticed a leak last time you waded that you get that leak fixed. Go through your tackle and see if you need to replace or add some baits. Also, check for rusty hooks on crankbaits. If you notice rust, replace those hooks. Some folks like to replace the standard hooks on their crankbaits with a specialized crankbait hook. Now is the time to do that as well. If this is the year you update the sonar on your boat, you’re going to be impressed, even amazed, with some of the new technology. Raymarine has been the leader in big-water sonar for a long time, and anglers are starting to learn of all the advantages they offer for the smaller inland waters. Raymarine has a sonar unit that will be perfect for anglers of any level of expertise. You owe it to yourself to check them out if you’re in need or want of a new depth-finder, and they truly are more than depthfinders. I discovered recently that they’re making line even less visible this year, and the eyes on baits that you tie your line to are smaller also. Tie a few knots to see if you need to take some cheater glasses along to help tie your lure to your line quickly. Make this the year that you’re ready to go fishing as soon as the fish are ready to be caught and you’ll enjoy that first trip even more.